We are so excited to welcome this new addition to our rental family. Come and savor the sea breeze and relax in front of beautiful ocean views from every room of this clean, comfortable, well-appointed, one bedroom, one bath villa surrounded by palms. This one level "getaway" features hardwood flooring throughout the common areas and a spacious screened porch overlooking the Atlantic Ocean. The fully stocked kitchen features stainless steel appliances. Gather for your morning coffee or your evening supper around the four-person dining table splashed with loads of sunlight. Sleeping accommodations for up to four guests include a bedroom with a king bed and a sofa bed in the living room. The Port O'Call complex offers access to the Port O' Call Community Pool and charcoal grill. WiFi. Linens. No Smoking. No Pets. Parking for 2 cars, community pool, access to the beach. Bedroom 1: King bed, sitting/reading area, HGTV, WiFi, sliding doors to the patio. Bathroom: Full bath with in tub shower. Living room: Queen sofa bed, plenty of seating, HGTV, cable, WiFi, sliding doors to the patio. Dining: Table for 4 with 3 extra barstools at the kitchen bar. Close to the beach and very close to the pool. Property was clean and fairly well maintained, considering it is a rental. A lot of foot traffic noise from above. I don't think the neighbors above were particularly noisy. I believe it had to do with the construction of the building. We enjoyed our stay. The view out of the front windows and from the porch was very pleasant. The bed was very comfortable. The two main downsides were the old/rusty shower/tub and the toilet. Both were clean. However, the toilet is low to the ground, more suitable for a ten-year-old than an adult. The toilet's flushing power is insufficient to take care of one of a toilet's two job duties. There is a plunger. Need I say more? Back to positive. The decorating was nice and the kitchen was modern with a large refrigerator that was pre-cooled when we arrived. Check-in with Island Realty was pleasant. The shower water becomes warm very soon after you turn it on. The heating and cooling worked well. Furniture was nice. There were plenty of all-cotton towels for two persons for a week. There were plenty of blankets for cool nights. There were several good jigsaw puzzles. There were flashlights in case the power went off (it didn't). There was even a Gideon's Bible. There were plenty of nice dishes, plates, glasses, and coffee cups. It was nice to have extra paper towels, toilet paper, and soap. Some things could be better. The neighbors above were noisy, but they were not not noisy very late or very early. Another neighbor smoked on his porch in the late afternoons. I would put a regular height table on the porch instead of the tall table that is there now. The porch chairs seem somewhat tipsy. One front window does not open. There is a loose screen on the front porch. The blinds above the couch are difficult to open. Also, the windows needed cleaning. Some of the silverware was rusty. I would have liked some sugar packets (there was salt and pepper). A broom and a dustpan, a squeejee would be nice. The air vent covers need to be replaced or repainted. Also, hot pads and dry measuring cups would have been nice. I know that this is a lot of detail. We enjoyed our stay and would certainly like to come back. It would be even better if some of the improvements could be made. Thank you for taking the time to write a review of this property. The owner greatly appreciates you input and has corrected all the items you listed. The unit looks wonderful and they invested in an interior designer coming in and creating a beautiful luxury feel. We look forward to you coming to stay with us again and please do not hesitate to call us if you need any assistance with your next reservation. We were very upset to find out that we could not use our cell phones because we could not get a signal in this condo. Yes, there is wifi, but we were unexpectedly unable to communicate using our phones with our family and friends. This should absolutely be stated upfront before renting this condo. I called Island Realty but was told reception is spotty on the island. But we have stayed in other places in IOP and absolutely did have mobile access. I asked if they could install a hot spot/booster and their answer was an absolute "no." I saw on the website photo that the bathroom was not updated but could not see the peeling paint on the ceiling, stained tub, and hole in the wall. The kitchen has been updated. Everything works although it took 3 days for the icemaker to make ice. The place had been cleaned prior to our arrival. We chose this condo for the porch and the view. The views from the porch and every room were more spectacular than expected. Truly beautiful. We would not stay in this condo again or recommend it to a friend because we unexpectedly could not use our phones. 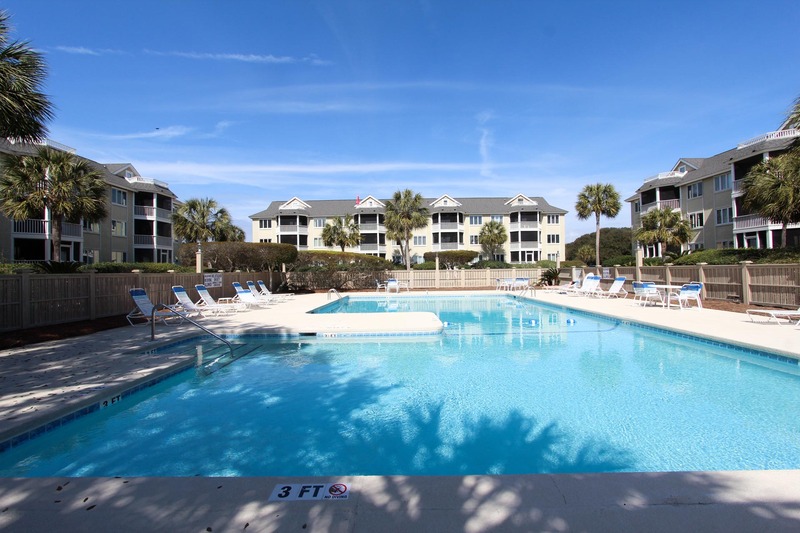 There are other vacation rentals on IOP with beautiful views in addition to mobile access. Thank you for taking the time to leave a review. I have passed along your concerns to the owner, we look forward to have you stay with us again soon. Light bulbs missing from light fixture in bathroom. Sliding glass door lock (living room side) was broken and therefore, could not be locked. Screen on porch (front) was not secured and flapped open at bottom with strong breeze. Plus there is a hole in the screen. Screen did not extend all the way down to deck on left and right which allows insects to get in. Chairs on deck are uncomfortable and really should be updated. The table is unsteady to put drinks on without fear of being knocked over. The can under the table has cigarette butts in it. I thought this was a non smoking unit. The TV in the bedroom was connected to cable but did not work on cable. Looks like it only worked for DVDs. Kept bumping my head into light fixture above kitchen table. I generally do not complain, but overall, we were disappointed in the unit as it badly needs to be updated. I have stayed at beachfront condos before that were in excellent condition and costs less. I have also stayed at POC in the past and was totally satisfied, so I was very surprised this time as I expected better quality for what we paid. The sheets were dirty and had sand on them, but since it was 11:30 p.m. when we discovered this, I changed and washed them myself. Also, the sheets are dingy and need to be replaced. The ceiling in the bathroom is peeling and is in need of scraping and painting. Old style ceramic tub with sliding glass doors and since the shower head is attached without a hand-held attachment, I seriously doubt the tracking has been cleaned in quite some time. One section of the screen from the "screened in" deck was completely missing which allowed bugs free rein. The unit was "clean enough" but since I paid a cleaning fee, I would have assumed I would not needed to clean. We have stayed in Wild Dunes for years. Port 'O call units are usually our top selection due to location and since there are only 2 of us traveling it suits us. We have noticed a decline in the units over the last 4 years and this year was no exception. The units definitely need freshening and F201 was no exception. All of this being said, it didn't "ruin" our trip, but we are certainly considering looking at different units or locations in the future. Relaxing,quiet, with a view everywhere you look.Great beach,good pool with perfect temperature. This property is a great location and has a beautiful view from living room, bedroom, and entrance. It was clean and comfortable. The only negative was the kitchen was missing a few things I would expect in a "fully stocked kitchen" such as measuring cups and pot holders. I would recommend this condo and Island Realty was friendly and readily available. We absolutely love Wild Dunes and Port of Call. The people were great and the beaches were not crowded. We had a pool next to our room so we had everything. The condo was AMAZING!!! We enjoyed sitting on the screened porch listening to the ocean and our son had a blast playing in the pool and the ocean. We will definitely be back!!! Cozy condo with an amazing view of the ocean - just steps to the beach. Perfect for me, my husband and two year old son. The bed was very big and amazingly comfortable. Enjoy your coffee in the morning and all your meals on the beautiful screened in porch. We left relaxed and happy. I highly recommend this condo and Island Realty. Do note the condo was very clean but is not the most up to date on furnishings and the bathtub.